Day Hikes Around Ventura County is a comprehensive guide to 116 of the best hikes in this scenic coastal county just north of Los Angeles. The hikes span from the Pacific Coast to the mountainous interior and the Los Padres National Forest. This is a comprehensive guide that includes trails from national forests, state parks, wilderness area, undeveloped coastline, and green space within the metropolitan areas. 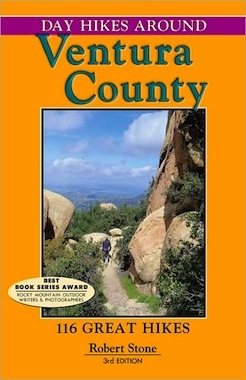 No other hiking book concentrates exclusively on Ventura County. A vast cross-section of scenery, geography, and difficulty levels is included to accommodate all ranges of hiking experience. Highlights include coastal estuaries and tidepools, long beaches backed by bluffs, expansive sand dunes, waterfalls, swimming holes, narrow gorges, rolling meadows, dramatic sandstone outcroppings, caves, ridge walks, historic sites, filming locations, and panoramic overlooks. . .everything from relaxing, scenic strolls to mountain-to-coast hikes with expansive views. All hikes can be completed during the day and are within a half-hour’s drive of Highway 101, the major access road.